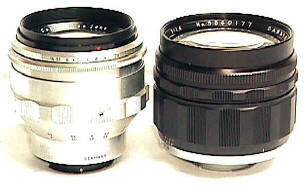 When you say "Exakta lenses," Japanese lenses are usually not the first thing most people think of -- not with the fabulous optical heritage of Zeiss, Schneider, Kilfitt, Novoflex, Astro, and Tewe. 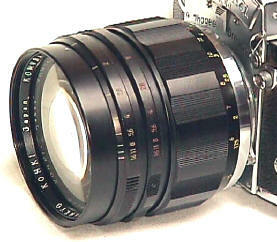 Yet, strangely enough, Komura probably made the fastest 85 portrait lens ever for Exakta, their 1960's vintage 85/1.4. It's a pre-set lens, which means the photog must pre-set the selected aperture, and then manually stop down the lens for the exposure, and then manually reopen the aperture for bright focusing. 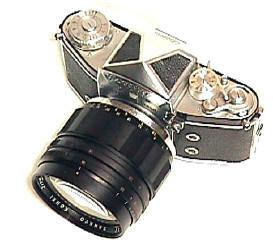 Before the first automatic diaphragms came along for Exakta in 1955, pre-set lenses was the cutting edge of technology. Don't laugh too hard, imagine what they will say about your EOS or F5 in fifty years!! 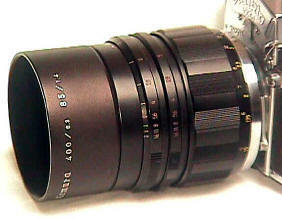 Hardly a compact lens, it weighs in at 1 lb 10 oz, measuring 68mm from filter ring rear lens mount, a diameter of 75mm, a filter size of 67mm, and a close focus of 1 meter. 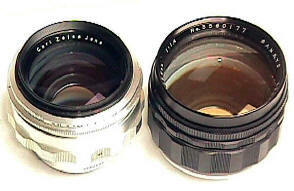 This example has a non-interchangeable mount, though some sources list it as an interchangeable mount lens. 1960 list price was $195. Today the 85/1.4 Komura is a very hard to find lens. 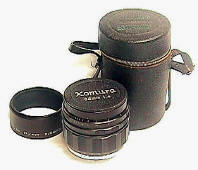 If you are lucky enough to find one, it is a find indeed if complete with its original lens case, lens shade, and front and rear lens caps. 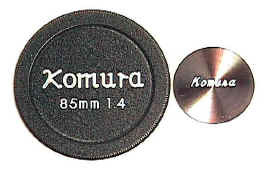 Komura 85/1.4 beside the second fastest Exakta portrait lens, the Zeiss 75/1.5 Biotar.